Hiking with kids is not as hard as you may have led to believe. With the right planning, good gear and a great sense of adventure, you can make memorable hiking trip with your family. For my husband and me, it is the best time to deepen our bonding with our kids. 100% distraction-free time, we talk silly, make fun of each other’s music choices and discuss deep philosophical topics. Best time to start hiking with family is when your kid(s) are three months old or maybe one year old or maybe three years old. Nope, the correct answer is when you are mentally ready. Your kids will automatically take up your enthusiasm for outdoors after all you are their role model. We started day hiking with our kids once they started holding their heads up, obviously in a child carrier. They got their little packs when they graduated to walk the trail. It was a great relief for our backs and hair, though it took us forever to hike a mile. They had to inspect each stone, watch the bugs crawl away and ask questions about anything they find peculiar. We waited until they were strong enough to walk 8-9 miles a day with their backpacks. Meanwhile, we continuing day hiking, bumping up hike distance over the time. Our daughter was 9 years old, and son was 5 years old when they graduated to multiday hiking with backpacks for the first time. Nonetheless, we have met families backpacking with babies as young as 4 months old. It is a personal decision, though with babies be ready to carry lots of extra stuff. 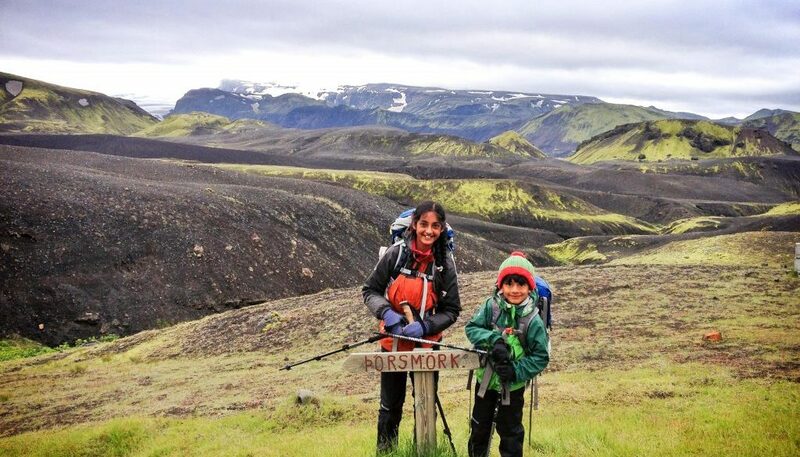 I don’t claim to have any success formula for hiking with kids, all these tips are based on personal experiences gathered over last six years of my family backpacking trips. Start with a two-day hiking trip, this will also test your gear. Find a trail based on difficulty level and distance which is suitable for your kids’ ability. It takes a little extra effort to mentally prepare young children for their first hikes. Build some excitement about your first backpacking trip by reading related books. Make sure to get required permits and make reservations for the campsites, if needed. We did a one-night backpacking trip in Argentinian Patagonia which was immensely helpful for our next backpacking trip. Tip from the trail: a trail with water body and diverse landscape is a great choice for the first backpacking trip with kids. This is definitely a daunting and crucial task, given the myriad of options for every single backpacking item. My personal philosophy is to spend wisely and spend once. We bought all the high-quality gear to use over many years. Weight and comfort are two major factors to balance while choosing the best gear for your adventure. We involved kids in gear acquisition operation to get them excited about backpacking. Tip from the trail: with younger kids, get 3-4 person tent. With teens, two 2-person tents are best to give them some space. 2-person tent needs less footprint and easier to set up and pack. We took several short trails around our house before venturing into the backcountry. Kids enjoyed carrying their shiny new backpacks and walking in their new boots, while we made fine adjustments to the backpacks and made sure boots were comfortable. We pitched our new tent in our backyard, and had a blast, though this made our dog very confused. I am blessed (and sometimes annoyed) with a perfectionist husband, who ensured stove, headlamps, water purifier, sleeping pads, and everything else was in order. Tip from the trail: It is always great to break-in your new boots before hiking. My kids have been hiking in national parks for many years and take pride in being junior rangers at many of these parks. They fully understand seven principles of “Leave No Trace.” These principles are the guidelines to enjoy our natural world in a sustainable way that avoids human-created impacts, please visit https://www.rei.com/learn/expert-advice/leave-no-trace.html for detailed understanding. Make sure to educate your kids on backpacking survival skills at their levels. We attended wilderness first aid lessons offered by REI local store. I would highly recommend it. Make sure backpacks are adjusted as per the body frame. Watch some videos on REI website about how to pack your backpack, this will save you lots of discomforts. Prepare a backpacking list not to forget anything. In case your trip is international, check if packs can go as carry on. Mine and my husband’s packs were little bigger than the airline’s carry on dimensions, and I made two sturdy sacks with thick fabric to protect in transit. You may like to read How to choose the perfect backpack for your family in three steps if you are planning to buy backpacks for your family. Tip from the trail: invest money to buy comfortable, light backpacks for kids and make sure weight of the pack is suitable for their built and stamina. Rule of thumb: younger kids’ pack weight should be 10-15% of their body weight. We let our kids fill up their “fun sack” within a certain weight limit. We have taken Forbidden Desert and Forbidden Island games with us, these are collaborative games and fun to play. Our son is a sore loser, and we can’t afford to have a grumpy hiker with us. I also pack a solar-powered Luci Inflatable Solar Lantern, to brighten our tent at night while we play and read. Tip from the trail: My kids enjoy writing about their day, and it is fun to read their musings. Encourage your kids to record the day in their special journals either by writing or drawing. Meals are personal choices. I always choose to go light by packing freeze-dried meals which can be cooked in their bags by simply pouring boiling water. This also eliminates the need to wash dishes, especially in cold water! Snacks are very important for little ones. We pack a variety of energy bars, turkey jerky, and honey stinger energy waffles. A cup of hot chocolate at the end of the day and a dessert after dinner are two special treats just for the kids. When it comes to the clothing, always think in layers. Pack wisely, keeping in mind the weather during daytime and nighttime. Never set foot on the trail without rain gear, never! Make sure to buy moisture wicking clothing, it is light and dries fast, very important for kids. Don’t forget to pack sunscreen, lip balm, and sunglasses, as well as gloves and hats. I always pack pure almond or walnut oil, especially while backpacking in arid and dry climates to keep our noses moisten at night. Tip from the trail: Pack an extra base layer to use as nightwear and always change before getting in your sleeping bag. I know, sometimes it is cruel to ask kids to peel off layers in subzero temperatures. I carry sleeping liners for such trips. It saves time to get ready in the morning! There are some wonderful apps to add fun to the trip. We always make sure to have the latest update of Sky Guide to explore the night sky, Gaia GPS for navigation, First Aid by American Red Cross, interesting podcasts to listen with kids and some music of kids choice. We take turns on listening to our favorite music. Tip from the trail: we recently bought GoalZero solar panel with power bank and it was a good decision. It is enough to charge our phones, which we use extensively to take photos and to navigate. Put your kids in charge to some degree to call for break-time when they need one. Remember while hiking with kids you may not walk long distances, but you will notice more flowers, stones, and insects. Make kids responsible for specific tasks, this will give them a sense of independence. Our son loves filtering water so he is our clean water supplier and our daughter likes to inflate all the sleeping pads. Little jobs keep them busy and happy. Outdoor is the best school to foster lifelong curiosity in your kids. Use field guides to identify the flora, fauna, rocks, or wildlife your kids encounter along the way. You may download few interesting apps, check here for details: http://blog.nwf.org/2011/08/the-best-wildlife-and-nature-iphone-and-android-apps/. You may introduce them basic navigation skills using a map and compass, fire safety, bear food tactics, depending on their age and trail. Wish you all the best for your next backpacking adventure. You may read about our first backpacking experience with kids at Patagonia – Fitz Roy and watch a short video of the trip traveling with family is fun. Great tips. I guess traveling with kids request much more preparation – I’m not really organized person, I believe that I have kids, I would be totally lost. Great tips! We are avid day hikers with the kids, but haven’t ventured into the multi-day hiking yet, but would love to soon! Just need to invest in some good gear. Like you said, it is amazing the deep discussions our family has out on the trail – my fav part of it. Full of sensible tips! Making it fun and going at the children’s pace is really wise advice, as is delegating jobs etc. It sounds like you have a great time on your expeditions. Such great tips. If you start small and keep your expectations in check you’re sure to raise a hiker. I love the tip to balance control and delegation! Such a wise pointer for being with our kids in general — on the trail or off! These are great tips! I wish we lived somewhere with a few more hiking trails – Central Florida has some moderate trails, but nothing with spectacular views! When we visit other places we love to take the boys hiking, but you’re right, with little ones it does take a long time! I am the river, the river is me. Kō au te Āwa, kō te Āwa kō au. © A speck in time 2019. All rights reserved.